Consulting Scientist –Research and Development, Southern California Edison Co. Rapid progress has been made in recent months both in research and in political information. Updating the April 1978 Newsletter. Full-day briefings to NASA program monitor officials were made by Dr. H. H. Kolm and myself in Princeton and at NASA\Lewis Research Center in May and June. Response was very positive, and in present NASA plans (subject still to the uncertainties characteristic of the annual August-September budget approval period) the NASA funding rate for mass-driver research should more than double by December 1978. In order to reach the agreed-on speed of development, though, SSI support must be continued. In an improvement over previous policy, we are now requested to investigate the lunar mass-driver as well as space reaction-engine versions. Intensive work by the student Summer Assistants has resulted in completion and assembly of the major mechanical components (structure, high-current feeders, and interconnects) over two-thirds of the length of a full 10-meter model. Coil-winding is ahead of schedule and will be a large part of the remaining summer program. As reported earlier, in 1978 we can afford to equip only the 2 1/2meter model (consisting of the first and last segments of the 10-meter model) with the necessary commercial components, but the achievements of this summer will give an excellent head-start toward 1979. As previously scheduled, the 2 1/2-meter model should be ready for test in the autumn of this year, and should be in operation at the May 14-17 1979 Princeton Conference. Increasing interest within NASA is being directed toward a return to the Moon, and establishment there of a base applicable to pure science experiments and to non-terrestrial materials feasibility tests. In support of this interest, and with the help of SSI, I am holding work-sessions this summer to which experts in the academic and aerospace communities are contributing. This work is expected to escalate in autumn 1978. David Kaplan, Rainer Malzbender, Bob Zacher, and Linda Plano are Summer Assistants on the Princeton mass-driver work, while Bill Arnold is working with Dr. Kolm at M.I.T. All but Ms. Plano had previous working experience with our group. Kaplan will enter the Engineering graduate school at Princeton this September. Scott Dunbar, who worked in the 1977 NASA-Ames Study, passed the Ph.D. qualifying examination in Physics at Princeton in May and has now begun work toward his Ph.D. thesis with me. His topic is in the area of celestial mechanics. Dr. Brian O’Leary, who is on leave of absence for six months, returns to Princeton in September. He will spend half-time on the NASA work, and the other half teaching a Physics course for non-scientists. During the 1978-1979 academic year I will again teach a graduate course in Physics. The total of this effort is roughly $0.5 million/year. 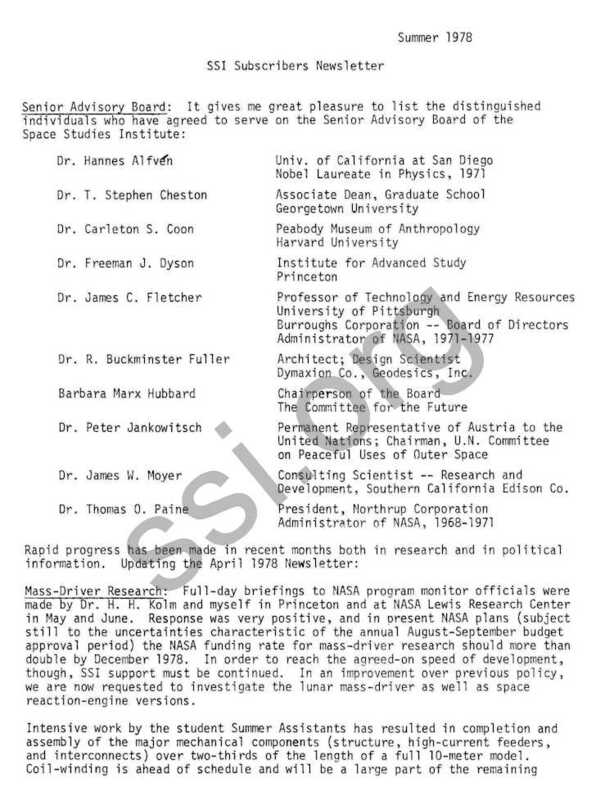 In a new development (subject as always to later change) a line-item New Start in NTM Research and Technology (a substantial escalation in funding, with a several-year lifetime) is now in the last year (FY 1983) of the present NASA five-year plan. In a planning sense that is only three years· away. NASA is now working on the FY 1980 budget, which must go to OMB and Congress next year. The Department of Energy has condensed its 3-year $15 million plan for satellite-power studies to 2 years. Briefings of all officials involved have been made. All of the DOE funds are going into exploration of possible blocks to satellite-power realization, particularly to studies of microwave biological effects. The question of NTM utilization is, in DOE’s view, part of the “transportation” issue, and wi 11, therefore, not be addressed by DOE, which regards transportation as entirely NASA’s jurisdiction. This is, in our opinion, unduly narrow, as NTM utilization directly affects the crucial issues of satellite power economics and environmental impact (through launch-vehicle emissions). During this past year a great deal of progress has been made in informing key elected and appointed officials on the NTM space­manufacturing concept. In recent months the House majority and minority leaders and, at the White House, the President’s Congressional Liaison have now all been briefed, in addition to a number of Senators and Congressmen who have expressed interest in our work. This activity is of special importance because the toughest barrier we must penetrate is that of un­familiarity with ideas, rather than technical feasibility. The House of Representatives has expressed its dissatisfaction with the pace of Administration satellite-power studies by passing Congressman Flippo’s (D., Alabama) bill calling for a $25 million demonstration study. Corresponding Senate action had not yet occurred at the time of this writing. The High Frontier Feasibility Act, introduced by Senator Harrison Williams (D., New Jersey) has now been passed by the Senate as part of the National Science Foundation authorization act. This bears directly on our work, as noted in the April ’78 .SSI Newsletter. The next hurdle presumably will be the Senate/House Conference Committee. A Japanese television company under the sponsorship of the Prime Minister has made a world tour interviewing ten individuals about energy in the year 2000 to prepare a 90-minute special program which will be shown in Japan on September 3, 1978. While they were here, the Director and Associate Director of the production company became subscribers to SSI. SSI is taking on an ever more important role by virtue of its long-term commitment, its single-purpose consistency, its independence of government funding, and its emphasis on scholarly research of high quality. 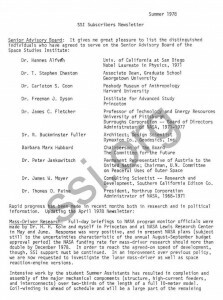 year-by-year basis, a continuing activity within NASA devoted to research into NTM utilization increases SSI’s responsibility and its vulnerability to funding delays or policy shifts in the Government program. Were the NASA program to falter at this time, and SSI attempt to fill the gap, SSI resources would be exhausted in a very short time. You will recall that the usual “crisis period” in the funding cycle is September-October, the period now coming up. It is, therefore, of particular importance that we continue to expand SSI’s subscription list, and that SSI subscribers make every effort to inform individuals capable of large donations of the importance and critical nature of SSI’s work. To help in that vital activity, we at SSI encourage you to photocopy and distribute the enclosed announcement and subscription form. I take this opportunity to thank you for the fine support you are providing to the Institute, support that is making it a powerful force in the direction of the High Frontier. Compilation and Assessment of Microwave Bioeffects A0-02-01/EA81028, D. R. Justesen et al., May 1978. This report may be ordered from National Technical Information Service, U.S. Department of Commerce, 5285 Port Royal Road, Springfield, VA 22151 for $6.00.